There has been much talk about how technology is changing the mortgage property risk landscape, allowing the industry to better connect, share data, work seamlessly together, improve efficiency and defend against uncertainty. I am looking forward to 2018 being the year where the borrower is at the forefront of all our thoughts. Whether buying a new home, building a property portfolio, lenders want confidence and borrowers want quick answers. Customers will interact with more controlling processes including booking their own valuation appointment slot with their mobile device as surveyors further embrace consumer facing technology. Non-physical valuations will increase so surveyors will have more capacity to provide other survey services and products. Innovation in the types of survey on offer will abound in 2018. Lenders will have greater oversight and control of the triage of valuation instructions blending data, distribution tools and mobile technology and will feature heavily in new contract discussions. With new build housing higher up the government’s agenda after the Autumn Budget, 2018 sees lenders and surveyors use new mobile tools and data sets to help them manage concentration risk and potential fraud in 2018 that hitherto have been denied them. The same old problems that at last have new solutions. 2018 will see growing professionalism in the buy-to-let market after the tax, duty and stress test triumvirate that has cooled the market recently. 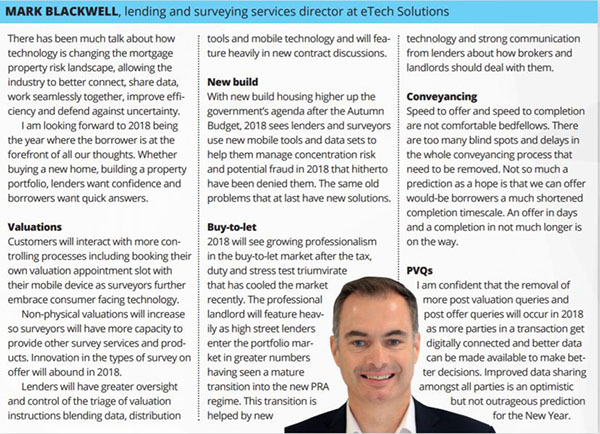 The professional landlord will feature heavily as high street lenders enter the portfolio market in greater numbers having seen a mature transition into the new PRA regime. This transition is helped by new technology and strong communication from lenders about how brokers and landlords should deal with them. Speed to offer and speed to completion are not comfortable bedfellows. There are too many blind spots and delays in the whole conveyancing process that need to be removed. Not so much a prediction as a hope is that we can offer would-be borrowers a much shortened completion timescale. An offer in days and a completion in not much longer is on the way. I am confident that the removal of more post valuation queries and post offer queries will occur in 2018 as more parties in a transaction get digitally connected and better data can be made available to make better decisions. Improved data sharing amongst all parties is an optimistic but not outrageous prediction for the New Year.